Shanghai, China, March 26, 2017: Leading developer The First Group is showcasing the unrivalled opportunities in Dubai’s property market to Chinese investors at this week’s Dubai Property Show in Shanghai. The British-owned firm, which is one of Dubai’s most respected international hotel & property developers, is presenting its portfolio of more than a dozen existing and up-and-coming UAE-based properties at the event. Best known for its collection of highly popular aparthotels in Dubai, The First Group has more recently forged a successful path developing landmark, upscale hotels in the emirate. The First Group currently has four hotel properties under development in Dubai, which will be managed by world-class operators and corporate partners Wyndham Hotel Group and Millennium & Copthorne Hotels. Millennium Place Business Bay, Millennium Place JVT Dubai, Ramada Plaza JVC and The One Dubai Marina, all of which are scheduled to open before 2020, will expand The First Group’s hotel portfolio to five properties. The firm’s first hotel, Wyndham Dubai Marina, opened in February 2016. These forthcoming additions have already attracted considerable international acclaim for their cutting-edge approach to architectural design. Ramada Plaza JVC was named ‘Hotel of the Future’ at the highly respected id Design Awards 2016 and also picked up the trophy for Leisure and Hospitality Project of the Year at last year’s Middle East Architect Awards. 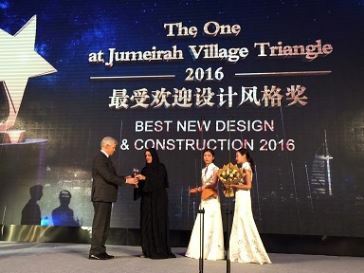 Now, marking a major milestone for The First Group’s growing presence in China, Millennium Place JVT Dubai last night received the prestigious Best New Design & Construction 2016 at a glittering UC Forward Gala Ceremony held at Shanghai International Trade Centre. UC Forward is a real estate sales and marketing consultancy and an exclusive partner of Fang.com, China’s largest online property portal with a 70 percent market share. With more than 34 million active members and 9 million unique users each month, Fang.com is the world’s most popular real estate website. A high-profile addition to Dubai’s famous skyline, the 34-storey Millennium Place JVT Dubai will bring 579 new rooms to Dubai’s inventory when it opens in 2019, just in time for Expo 2020 Dubai. The UC Forward award is the second honour bestowed on Millennium Place JVT Dubai in recent months with the property also receiving the Highly Commended Award in the ‘Best New Hotel Design & Construction’ category at the 2016-17 Africa & Arabia Property Awards. Just as The First Group is intent on expanding its presence in China, the company has moved quickly to capitalise on emerging market interest in Dubai’s property sector, opening offices in 10 countries including India, Russia and Turkey. “Its rapid international expansion mirrors Dubai’s growing reputation as a global property investment hotspot,”- said Rob Burns, The First Group COO. “While established property investment markets are stagnating, Dubai continues to offer international investors significant opportunities,” he continued. Burns noted that Chinese investment in Dubai has grown substantially in the past decade. In addition to lucrative property investment opportunities, The First Group provides investors access to a host of benefits in conjunction with internationally renowned partners such as Emirates Skywards and Jumeirah Group. Owner rewards include free Dubai holidays, access to a travel concierge service, and premium membership of Jumeirah Group and Emirates loyalty programmes. In addition, investors in property through The First Group can benefit from locally tax-free returns, investment property credit and cash rewards for referrals. The First Group is a British-owned international hotel & property development company, whose principals have built up their expertise and success in the global market over the last 30 years. The First Group management team draws from strong and diverse backgrounds in the fields of global property, finance, acquisition, marketing and product development. Its expert eye for emerging property market potential and prestigious partnerships with industry leaders means that their clients can enjoy secure and attractive returns from one of the world’s most vibrant hotel markets. With its headquarters in Dubai and global presence spanning Algeria, Azerbaijan, Ghana, India, Kazakhstan, Nigeria, Oman, Russia, Saudi Arabia and Turkey, The First Group’s client base is expanding rapidly. For more details visit www.thefirstgroup.com. UC Forward is a real estate marketing consultancy with a focus on promoting the Dubai property market to Chinese investors through multiple channels. UC Forward has the exclusive rights to operate and market Dubai property with the #1 real estate web platform in China, Fang.com. It provides services to property developers and agents who share its vision of growing the interest of Chinese investors in the Dubai property market. With its tremendous reach to Chinese affluent and clientele, UC Forward continue to be the best and most professional platform connecting the UAE with China. For more details visit Dubai.fang.com or register at www.amazingdraw.com.